I'm working with Unity and MM6, how do I get maps and buildings into Unity? I noticed some people are able to rip models/terrain from the Might and Magic 6 and 7 data files and port them into Unity3D. How does one rip the models and terrain and reconstruct them in Unity? Is middleware like Blender or Maya required to convert them, or are you using scripts to directly read and reconstruct everything in Unity? https://www.facebook.com/mm7engine devs have achieved this with both MM6 and MM7's map files. Re: I'm working with Unity and MM6, how do I get maps and buildings into Unity? This is what I'm talking about. How is this possible? It's awesome! I think that are easy works but very, very long time is needed to do it. Then convert to FBX because Unity doesn't support OBJ. There's a batch tool that can do it. That's how I tried. The Unity part didn't go well, because it was my first and only look at it. It worked like a charm. The export went quickly, and Unity accepted the .OBJ/MTL. All I had to do was select each texture, set them to Point filtering, select each material and set their smoothness to 0 and it looked very accurate to the real game. Okay, guys. I did it. It's still uploading to Dropbox (10 mins left or so), but it works. I ripped tons of assets from MM6, converted and cleaned them if necessary, and re-assembled the menus/ui/scrolling text/music/sfx in Unity3D. What I have here is a working main menu system that leads to a mostly working New Sorpigal through the Quick Start button. I even put in a moving camera to prove it's all real. It's not complete, I can do way more, but it's finally visually interesting enough to share with other people. Please ignore the enlarged textures, my rip contained the 2x textures from the HD mod. In all, it took about 3 (fun) hours or so. A lot of this work was figuring out how to convert .smks into AVIs, and then Handbrake them into MP4s that Unity can play. Another big roadblock was learning Unity's UI/button system. The map rip was also difficult, by default all the materials were shiny and the textures were blurry. I turned off AA, dropped the textures to point filtering with no MipMapping, removed the shinyness on all materials, tweaked the lighting, and ended up with this. It still needs some work, but I think it REALLY resembles the old/archaic look of early 3D games before hardware started ruining and blurring all the beautiful textures. Big thanks to GrayFace, his tools made all of this possible. Same goes for the creator of MM6Viewer (St0rmCat). I'm so happy to see this come together, I've wanted to do this since discovering MM6 in 2005. 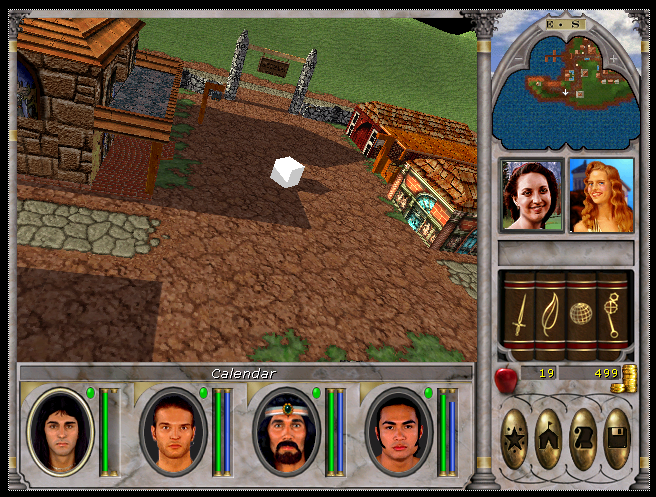 Thanks to these tools, Might and Magic VI has a chance of being revived, just like Daggerfall Unity. I see no reason that MM6, MM7, and MM8 could be ported to Unity now in full. The maps and models were the last hurdle. Last edited by Macintrash on May 30 2016, 18:58, edited 2 times in total. Good work :-):-):-) Nice to see work on MM. Cool, why don't you join the remake team? Sorry to dig up the old thread, but how do I export obj files from a game? I've trying this last few days, and I installed grayface patch, and editor, and editor seems to work, because when I press ALT-F1, mouse icon changes. I can fly, and all, but when I press CTRL-S, nothing happens. OBJ folder is empty. Is it possible to export New Sorpigal whole terrain level with buildings? I am using GOG version of MM6. I just imported in 3DS Max, and everything was just perfect. I was kind'a expecting that some textures path were lost, or normals inverted, but no , scale, objects, textures, normals - perfect! And thanks for all patches, and mods, and editors you provide us trough all this years, allowing many people to recreate whatever they want.